Blog post by Exhibitions Intern Ryan Mercado. To read more posts from JMM interns, past and present, click here. I lived in the Washington DC area all my life. I remember taking field trips to the many impressive Smithsonian Museums on the Mall in DC when I was in elementary school. Those initial visits shaped my idea of what a museum is: A large impressive sandstone building with exhibits of objects behind glass. That was how museums were to me. It wasn’t until I went to the new “Newseum” (a museum about media) in DC that I got a taste of how museums are evolving and adapting to the 21st century. Multiple interfaces lined the halls, exhibits were interactive, and you could even go up to a chunk of the Berlin Wall and touch it! Few objects are behind glass there! My visit showed me what a museum can be as it transitions to new medians to keep people interested and entertained during their visits. This was the future of museums. 4040 Boulevard Saint Laurent is the seven story address of the Museum of Jewish Montreal. This placard on the building tells of its past history as a garment factory with extensive Jewish history. When I started my internship at the Jewish Museum of Maryland (JMM) in June 2017, I began working in a much more traditional brick and mortar museum doing extensive research on a new exhibit. The JMM is getting more modern and interactive, but it still has a long way to go. 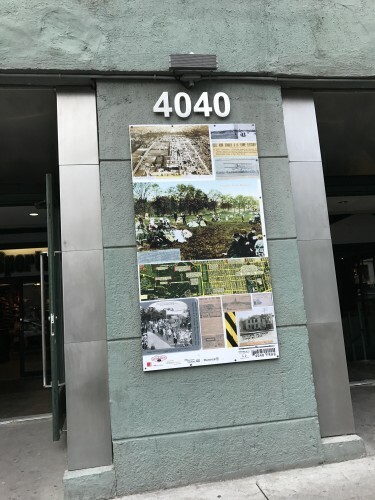 In late June, I took time off to head up to Montreal, Quebec, initially to go apartment hunting, but then an idea struck me: Why not connect the JMM with the Museum of Jewish Montreal? I had studied abroad at McGill in the Fall 2016 Semester, writing numerous papers on Jewish Montreal while there, and even visiting the city’s Jewish Library. Yet, I never visited the Museum of Jewish Montreal. I knew small details about it, that it was fairly new, and that it did walking tours. Networking between the two museums seemed like a good idea to me, so I asked Rachel and she gave me the go ahead. I arranged to take a walking tour, which you can read about here, and I also scheduled to sit down with the Zev Moses, the Executive Director of the Museum who started it back in 2010. The Front of the Museum on Boulevard Saint Laurent. When I walked into the Museum on the afternoon of 23 June, I was greeted with a long turquoise colored room with large windows and exposed pipes. It certainly was very modern. I chatted a bit with the walking tour guide who had just given me a very pleasant tour. I ordered some coffee and a slice of coffee cake and was soon greeted by Zev. We sat down at a table and began our conversation. I asked Zev questions ranging from how he got started with the Museum to how he has gotten to this point. Zev’s story is truly remarkable, he began his the museum with an initial thought to try something new after leaving a former job in 2009. He noticed that many people were getting laid off and that businesses were not hiring. Zev was right, as anyone who lived through it remembers; 2008-2010 was truly a terrible time for the world economy. Also during this time, Zev became curious of his surroundings. 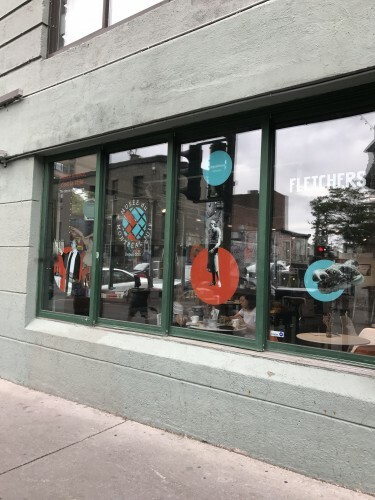 Having studied City Planning in Philadelphia, his trained eye noticed that there were many buildings in the Plateau neighborhood of Montreal that looked more or less like synagogues, or had some clues/ traces of their Jewish past. He eventually looked into one building in particular that he lived across the street from and found out it was one of the largest synagogues in the city! It had a massive 40-50 year history that no one knew about. Zev began to collect information about other buildings and places online and created an interactive map. His project eventually would grow into the Museum of Jewish Montreal that exists now, with a permanent space on St. Laurent boulevard in Montreal’s historic Plateau Neighborhood. Inside the museum’s main room with a gift shop on the left, a café on the right, and a small photograph exhibition on the back wall. The room is very modern with exposed pipes and wide windows. What is so interesting about Zev and his approach to this Museum is that its development and approach to museums is different. This Museum is not like the JMM with artifacts behind glass with placards. This Museum is mostly online and the current presence they have is geared more towards a community aspect. The Museum regularly hosts many events, and Zev told me that the Museum and its staff regularly try to think about what works and what doesn’t. What do people want to see in a 21st century museum? Zev’s answer to that is treating people differently. That has materialized in creating a museum that is much more interactive with walking tours, community events, and use of technology to enhance visitor’s experience. For those looking for extensive histories and exhibits, those still exist, just online. 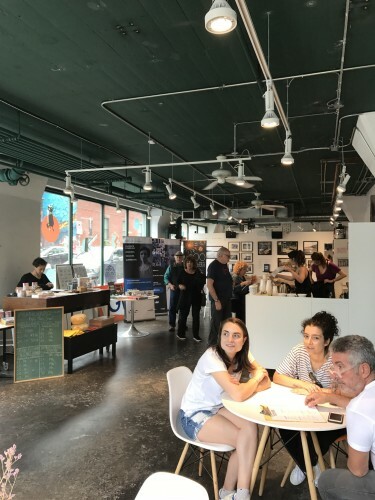 The physical space is much more community-centered with a gift shop, a small photograph exhibition, and a café with Jewish-themed food. Walking tours meet here just before heading out as well. When I think about what my perception of museums are, and what this new museum is, I find that this new approach makes sense. Most people only spend 1-2 hours at museums simply walking around, looking at objects, and then leave and forget about what they saw. Not at the Jewish Museum of Montreal. While there is no permanent exhibition that many people would expect to see at a museum, you still walk away with much more than what you would in a traditional brick and mortar museum. The walking tour I took was much more exciting and memorable than a walkthrough of an exhibition. I did not attend any community events there because of limited time, but I’m sure those are memorable as well. As for the website, I checked out their online exhibits after my visit and they’re impressive. The large range of topics and history available are perfect for anyone who has a smartphone or who simply is curious. And to be honest, we millennials spend much of our time online than actually going to museums to learn, so this online presence is genius! One question I was particular keen on asking Zev was how he coordinated with the other Jewish organizations in the city, such as the Jewish Archives and the Jewish Public Library, who have supplied his Museum with historical materials he needs. I ask this because at the JMM I am so used to simply walking to the library or downstairs to the archives to fetch an item or photo that I need to look at for my research. How does the Montreal Museum do this? Zev explained to me that at the onset of the Museum’s development that he was able to acquire good deals and prices for rights to photos and other materials. This makes sense for a mostly online museum like this one; there is no need for the Museum to have its own archives either when the City of Montreal clearly has two very good institutions dedicated to that job. 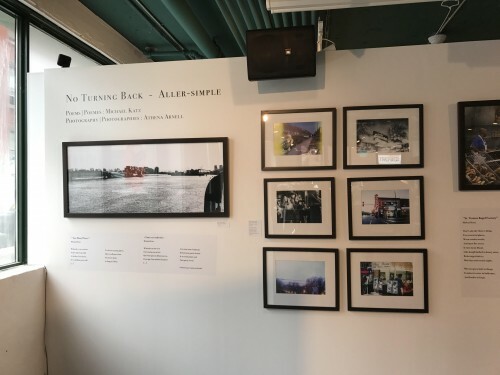 The Museum’s small photograph exhibition titled “No Turning back – Aller simple.” It features beautiful photographs and poems. As I finished up my interview, I asked one more question, which was where did Zev see the Museum going in the future? Zev explained to me that after a good first year in the new permanent space that he first wants to consolidate what he has and expand on that, after all, starting any business, especially a nonprofit organization like a Museum is hard. However, future projects were still on his mind. He explained to me that he hopes that walking tours, which happen in the warm summer months, could possibly continue on in the winter. How that can happen though is unclear, however the current building where the Museum is housed, in and old garment factory with Jewish history could be a potential site. I finished the interview there, chatted for a bit, finished my food, and then left. As I’m writing this up now a few weeks later, I realize that Zev’s project, while new and developing, is what a 21st century Museum should look like. Gone are the days of traditional brick and mortar museums, the world is becoming more digital and more refined. People want more than just a walk through, they want interaction and involvement. The Museum of Jewish Montreal’s walking tours and their community-centered events are what Museums need to focus on. History and exhibitions are still very much a part of Museums, but they should no longer be the main focus. What the Museum of Jewish Montreal is doing is what Museums need to start incorporating if they want to thrive as society changes around them. If you find yourself in Montreal, go check out the Museum, take a walking tour. Or better yet, if you don’t have the means to visit, go to their website and check out their exhibits. I’ll definitely go back to the Museum once I move to Montreal permanently, I really want to go on the other walking tours available… and I really want another piece of coffee cake from the café.